Now Mac users can avoid getting lost and look cool doing it. It offers the basics and is easy to use but lacks the finesse and refinement we're looking for. We first came across RouteBuddy at the Paris and then the London MacExpo. 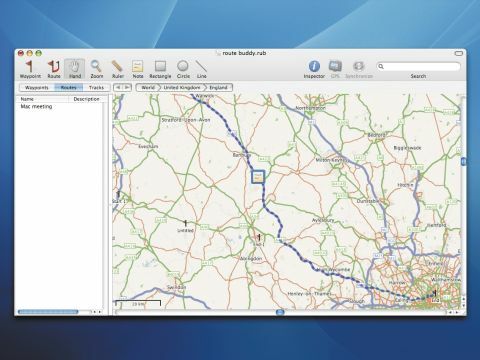 This is a native Mac GPRS tracking application that works with common GPRS boxes including Garmin USB and USGlobalSat devices. If you don't have one of these devices, you can always print out your route. The layout of RouteBuddy is its strength. We've seen similar apps for Windows that have a clunky look. RouteBuddy, on the other hand, is clean and clearly marked with colour coding. The developer, also called RouteBuddy, sells the program and maps separately. We installed the UK & Eire map (£26), which seems detailed and accurate. To set a route you click the Route icon and click on the map where you want to start the journey, then click the end point. RouteBuddy finds the route, and if you disagree with part of it you drag the blue route path to the road you want and it fills in the changes. In the icon bar you have more basic controls. We particularly liked the Ruler - a simple distance measurer that you can click between two points. You can also add sticky style notes to the routes. We tried RouteBuddy on a new MacBook Pro Intel Core 2 Duo and a reasonably new iMac G5. It was faster on the MacBook Pro, and woefully slow on the iMac. The maps are huge files (UK & Eire map is 469MB), and this can be a pain to zoom in and out of on a slower machine. Exporting routes was easy enough; it prints well and worked nicely with our Garmin test unit. One thing we would like to see in this program is automatic routing that takes the speed of roads into consideration. On our test route to Birmingham, RouteBuddy's first choice was A roads where motorways would have been much quicker. Fortunately, dragging the route back to any road you like is a complete doddle. We found this to be a useful and pleasing application, but you may want to think twice if you own an older Mac.